A simple coffee shop on the main street of the Zaatari camp holds a secret. 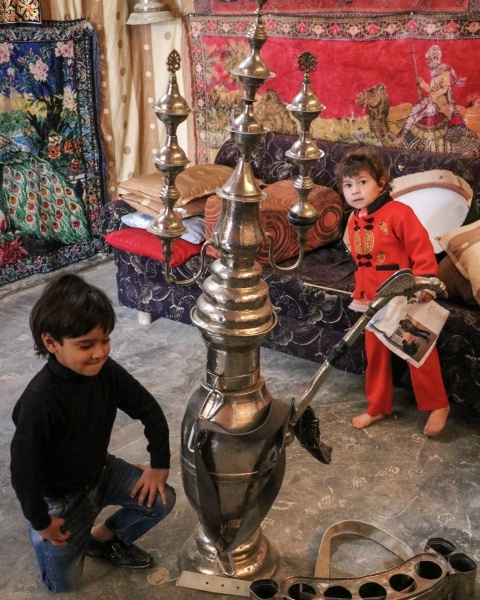 In a room in the back, a sword-dancing, chanting, brilliantly clothed group of Syrian men and boys practice the Aradah shabiya, a traditional Syrian folk dance, preparing for their performances in weddings and special occasions throughout the camp. The parties in those days were in the city of Homs, where Arada shabiya groups would perform at weddings as the bride and groom entered into the reception hall, celebrating the new union. They would also show up for celebrations such as the opening of new restaurants and the birth of children. In the Zaatari camp, the members still wear the traditional Syrian costumes when they perform: wide black pants, a shirt made of Damascus textile, and a brightly covered striped vest and a keffiyeh around the neck. 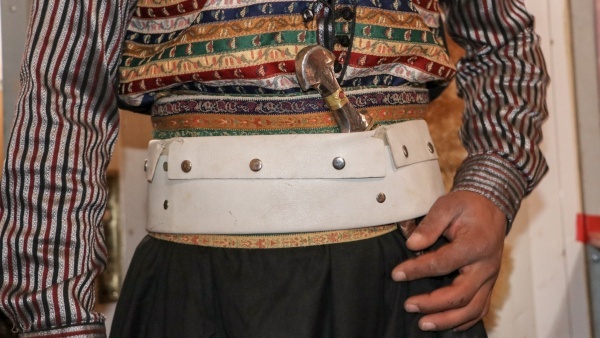 The men wear simple skullcaps on their heads and a special white leather belt sewn specifically for the costume, and some carry swords and shields handmade by a blacksmith from Homs who now works in Amman. The youngest member of the group, Mohammed, who is only five years old, wears a special purse around his neck that contains the Quran, as well as a large pocket watch on a chain. Rustum Ziad Rustum tells me that only his father wears different clothes for performances: the traditional clothes of a coffee and drink vendor, which was his other job in Homs. In fact, he carried his immense copper pot to sell tamarind juice with him all the way from Homs to Jordan when he fled. Abu Rustom brought this tamarind pot with him when he left Syria. 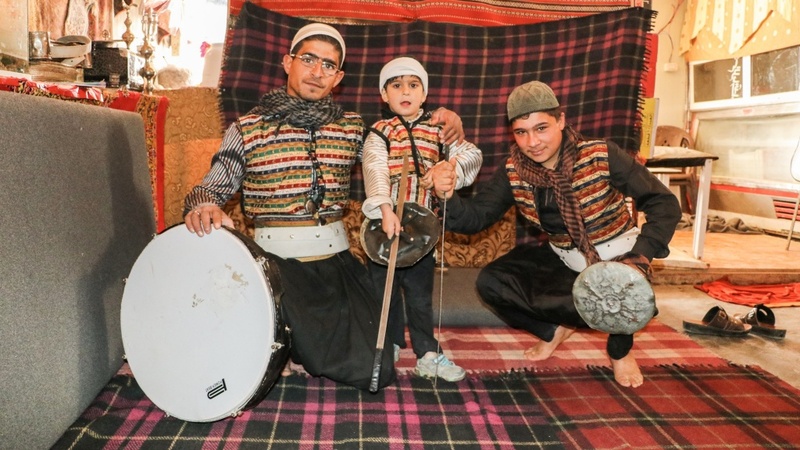 Five-year-old Mohammed has become skilled in sword dancing, tabla playing and singing, even though he was only a year and a half when his family fled from Homs in 2013. He has learned the art entirely in the refugee camp. In fact, the climax of the performance comes at the end, when he and his brother Rustom twirl their swords in the air before having a mock sword fight. Ahmad Mohammad Ghazaq, from Ghouta in Rif Damashq, did not come from a performing family, but says that he learned from years of watching others perform. In addition to the regular costume, he dons a traditionally made dagger in his belt. A dagger can be worn in the white leather belt as part of the costume. When I ask Rustom Ziad Rustom why he doesn’t wear a dagger, he sighs: he had one in Homs, but he left it behind when they fled the country. But he took his family’s history with him. “We keep the traditions of Syria alive,” he said.